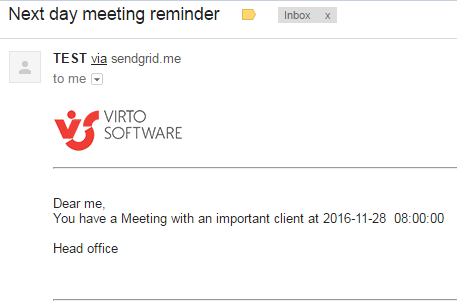 Virto Alerts and Reminders app allows you to use email reminders that are sent to remind about upcoming events or approaching deadlines. Whenever you schedule a reminder, each user assigned to this reminder will receive email with notification, which can include the fields that need his attention. Click “Add Reminder” to create a new reminder. Select the list with upcoming event(s) that you will be notified about. Type the title of the new reminder. The next two sections “Recipients” and “Message view” can be adjusted similar to Alerts customization. You have to assign the list of recipients who will receive this reminder. External email addresses are supported as well. Message view can be customized with field values of the list. The reminder email can be adjusted in the same way as the alert email. Then you need to define options to follow up an event. You can apply the reminder to all items in the list, to all items in a list view or create a custom condition to receive a reminder. In this example, we will use a custom condition to track any upcoming meetings with clients. Then you need to set the schedule when you will to receive the notification. You have to select a list field with time/date that will trigger the reminder sending and type the time when you need to receive the reminder. In this example, the reminder will be sent one day before the event begins. Note: reminders for recurrent events are supported as well. Now you can manage all your alerts and reminders in a single view.